The Farmhouse Hotel in Langebaan has long since been known for truly exuding farm style chic with it’s quirky decorations and beautiful, rustic interiors. However, the true meaning of farm style chic is evident in the food offered at the hotel’s in-house restaurant, Panorama Restaurant. If warm, comforting and darn good food is what you’re after, then you’ll be happy to indulge at Panorama Restaurant. The secret behind the hearty, home cooked meals at the restaurant is it’s Head Chef, Rozelda Conradie. 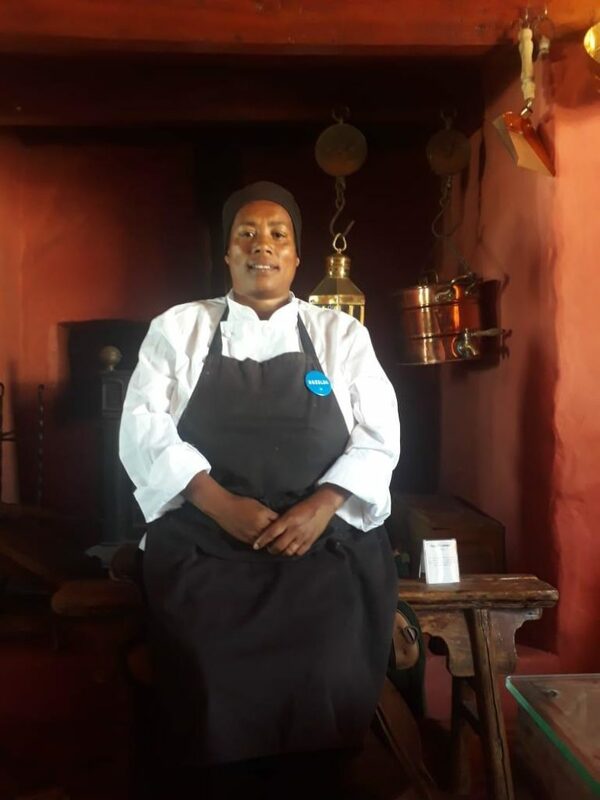 Rozelda has firmly made her mark on the restaurant, as she has been at the helm of Panorama Restaurant for a quarter of a century! The one and only: Chef Rozelda Conradie. Head Chef at Panorama Restaurant. What is your position at The Farmhouse Hotel? My position is Head Chef. How long have you been working for The Farmhouse Hotel? 24 years going on 25 years. I love the fact that it is a fast paced, creative and organized environment, and that is something about my job that gives me great satisfaction. The rush of being able to pull off an extremely busy night without any mistakes is very rewarding and satisfying. What do you believe goes into creating a wonderful dish? Love and the love for what you do. Any cooking secrets you are willing to share? 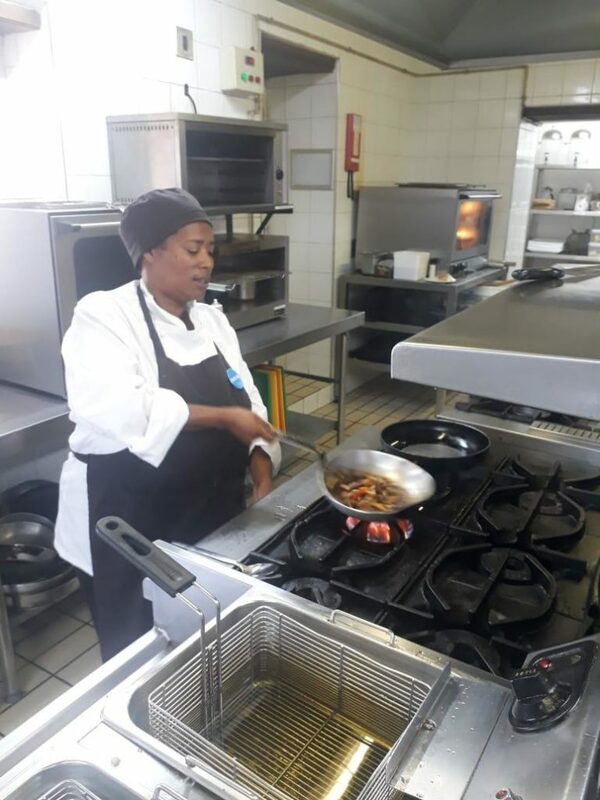 Chef Rozelda in action in her kitchen at The Farmhouse Hotel. In your many years at The Farmhouse Hotel what is the most exciting changes you have seen? A more structured management system since Village n Life took over! What is your favourite meal on the menu? That will have to be our oxtail for sure! 2kg trimmed oxtail, excess fat removed. Heat the oil in a cooking pot and brown the meat. Add the carrots and leeks, cook for a few minutes and sprinkle with flour. Stir fry a little and then add the wine, stock and the chopped tomatoes. Add the paprika. Add the fresh herbs and simmer gently for 3 hours; the meat must almost come off the bone and the liquid must be reduced to a thick glossy sauce. Add water if needed. Saute the mushroom in butter, season with salt and black pepper. Add mushrooms, crispy bacon and chopped herbs to oxtail just before serving. Garnish with a few pan fried mushrooms and some fresh herbs.